Low to medium shrub, 0.5-2.5 m tall, from creeping rhizome, often forming thickets; stems erect, much-branched, the slender branchlets usually somewhat woolly, later becoming smooth. Alternate, deciduous, short-stalked, oblong to egg-shaped, 3-10 cm long, coarsely toothed mostly above the middle, dark green and smooth above, paler and woolly-hairy to smooth beneath. Inflorescence a branched, narrowly conic to cylindric, dense terminal cluster of numerous small flowers, the cluster several times longer than broad, the branches often woolly; corollas deep to pale pink, the petals 5, egg-shaped to round-elliptic, about 2 mm long; calyces fine-hairy to nearly smooth on the outside, 5-lobed, the lobes triangular, bent back, about 1 mm long; ovaries superior; stamens numerous. Follicles, usually 5, short-beaked, 2-3 mm long, somewhat leathery, smooth except sometimes a few long hairs along the suture, shining; seeds several, spindle-shaped. Fens, swamps, bogs, streambanks, lake margins, and moist to wet thickets and open forests in the lowland and montane zones; common throughout BC, S of about 56oN; S to CA and ID. 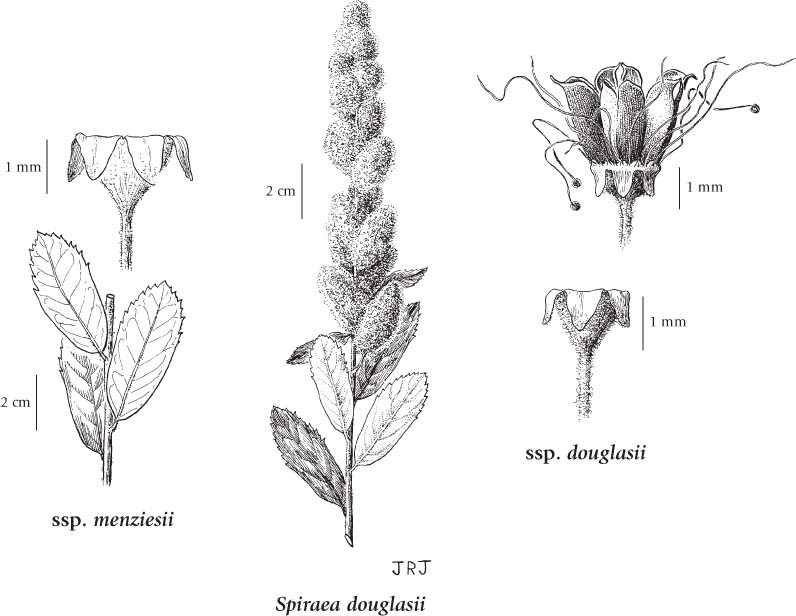 A shade-intolerant, submontane to subalpine, Western North American deciduous shrub distributed more in the Pacific than the Cordilleran region. Occurs in cool mesothermal climates on very moist to wet, nitrogen-medium soils; its occurrence decreases with increasing latitude, elevation, and continentality. Common, occasionally dominant, in semi-terrestrial communities and open-canopy forests on disturbed water-receiving and water-collecting sites. Tolerates fluctuating groundwater tables. Often associated with Gaultheria shallon, Juncus effusus, Myrica gale, or R..spectabilis. Characteristic of wetlands.